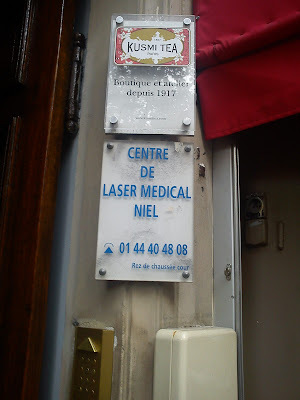 This week I have been on a business trip to Paris. As my refrigerator continues to be full of cheese, I decided to focus my shopping to tea and tea ALONE !!!! 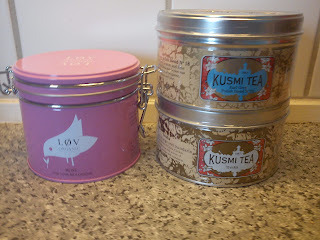 As I am a big fan of Kusmi tea, it is with big pleasure that I visit a Kusmi tea shop. First of all you can find the entire range of the different Kusmi and not just a selection as here in Denmark. And the second reason is, that you have the reason of buying refills, so the tea as it is in a tea bag without buying yet a metallic tea tin. 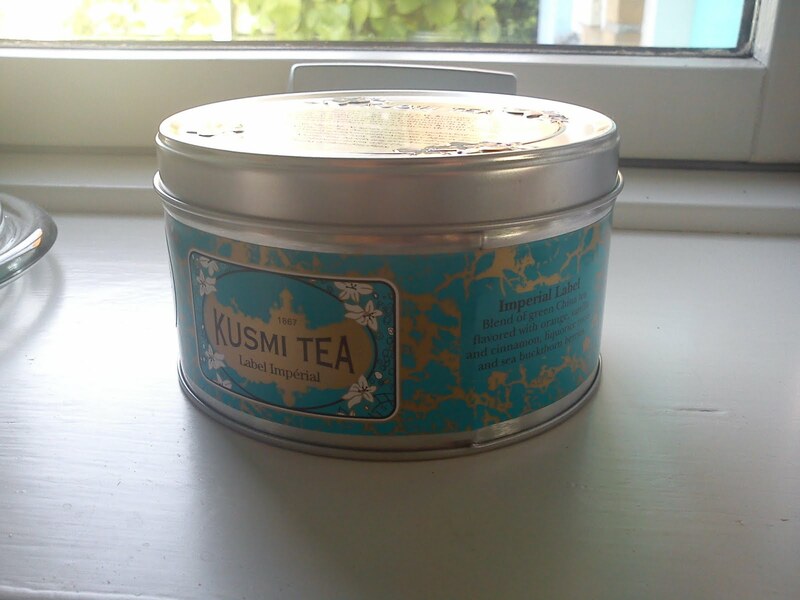 And third and finally the price level for the Kusmi tea is lower in France compared to Denmark. On my evening walk I visited the Kusmi tea shop on Avenue des Champs-Élysées. 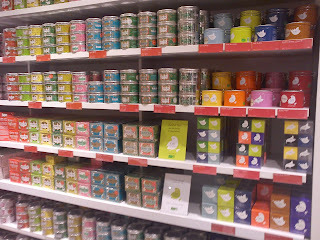 This is very trendy looking shop, light and full of colours from the various metallic tea tins. 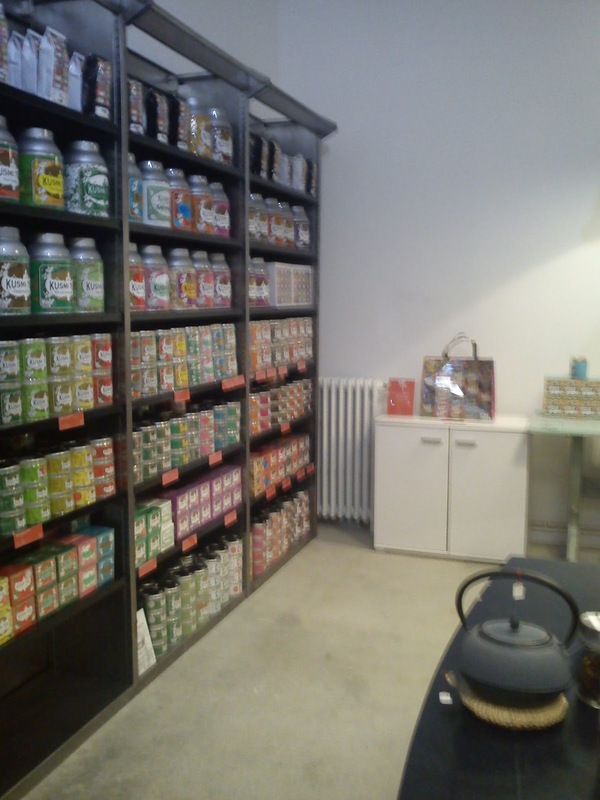 It is also possible to smell to the content of all the different teas. However, one thing is to smell to the tea, this does not always give you the actual taste of drinking the tea. Therefore I like it very much, when you are offered to taste a selected tea. However, I decided to do my tea shopping in the Kusmi tea shop located at 75 Avenue Niel. 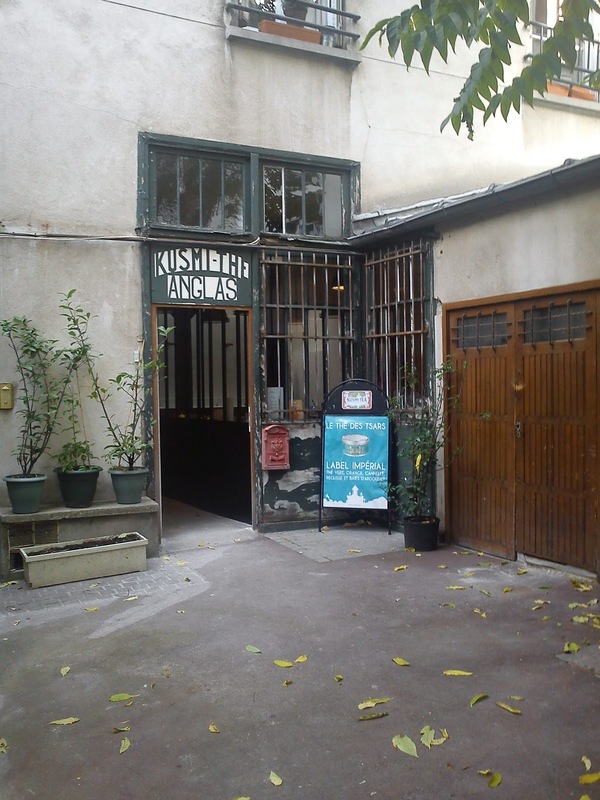 Here you need to know, that the tea shop is located here, as only a small sign on the street inform you about the presence of the shop. You walk from the street into a back yard, where the shop in located in a corner. I remember, the first time I went to this shop, where the interior of the shop was dating back to 1930-1940s with it's old fashion wall paper. 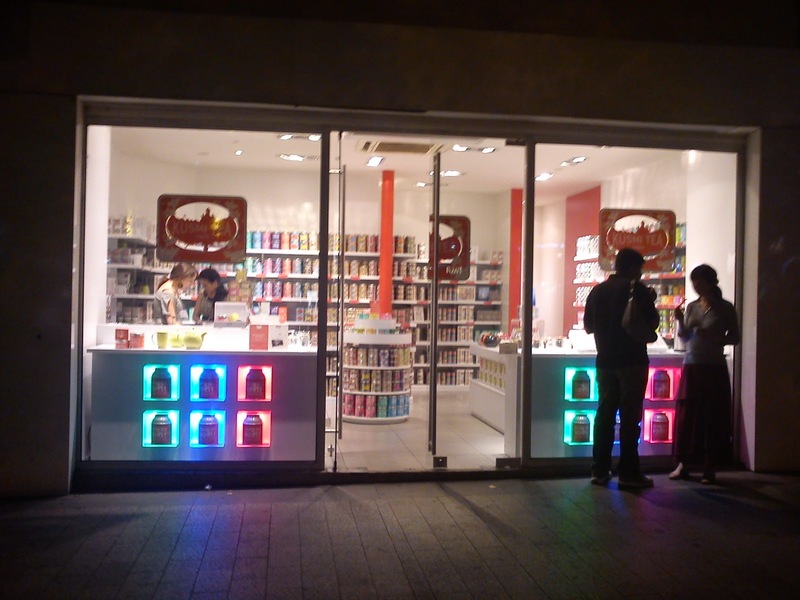 So it was a big surprise for me to see, that the interior of this shop was completely changed on the in-side. All the walls are now painted white and the design out-line is updated to the time of today. Anyway, I found four new teas for my tea cup. The first tea is in the pink tin, which is LØV ROSE being a organic black China tea scented with organic rose blossoms. 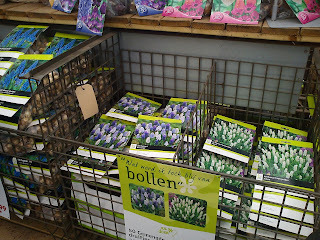 As you perhaps recall from previous postings, I have something with flower and food !!! The second tea is Earl Grey Polish blend No 18, which is a blend of China and Ceylon teas with scents of bergamot, lemon and lime. 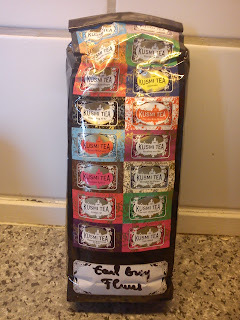 I have something with Earl Grey tea in various formats. The third tea is a second version of Earl Grey called Troïka, which also is blend of Russian blend of China, Ceylon and India teas with scents of bergamot, orange and mandarin. The forth tea is a third version of Earl Grey with flowers. 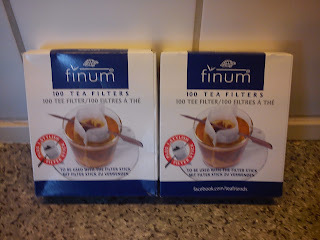 Finally I found some these paper tea filter for making one cup of tea. The benefit of using the paper filters is, that you do not get any tea fines floating around in your tea cup. 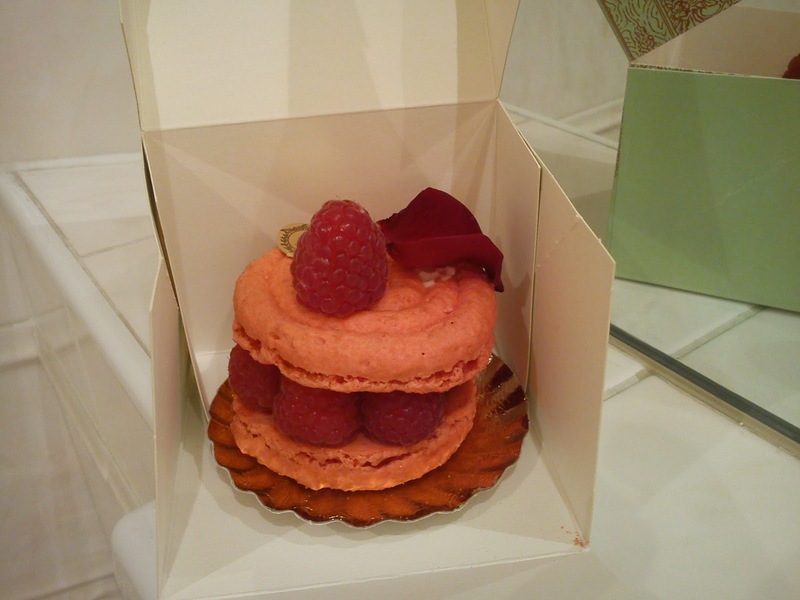 During a business trip to Paris this week I went cake shopping again at Ladurée in order to get some more steps. I am participating in step competition, where I virtual will be walking from Copenhagen to Berlin in the time period 15th September - 1st December. This means, that I every single day have to walk 10.000 steps !!!!! 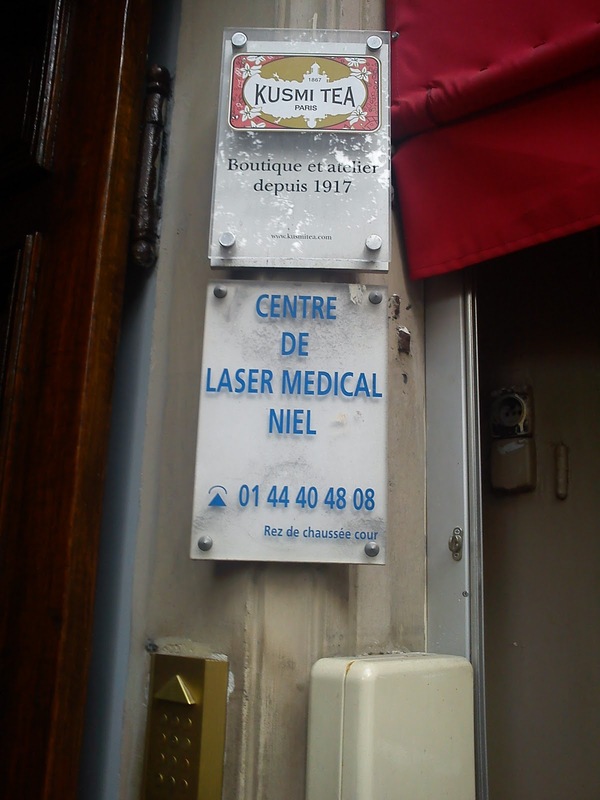 At my arrival at my usual hotel in Paris I as needing around 5.000 extra steps to get to the daily target of 10.000 steps, so what a "good excuse" for going cake shopping at Ladurée. 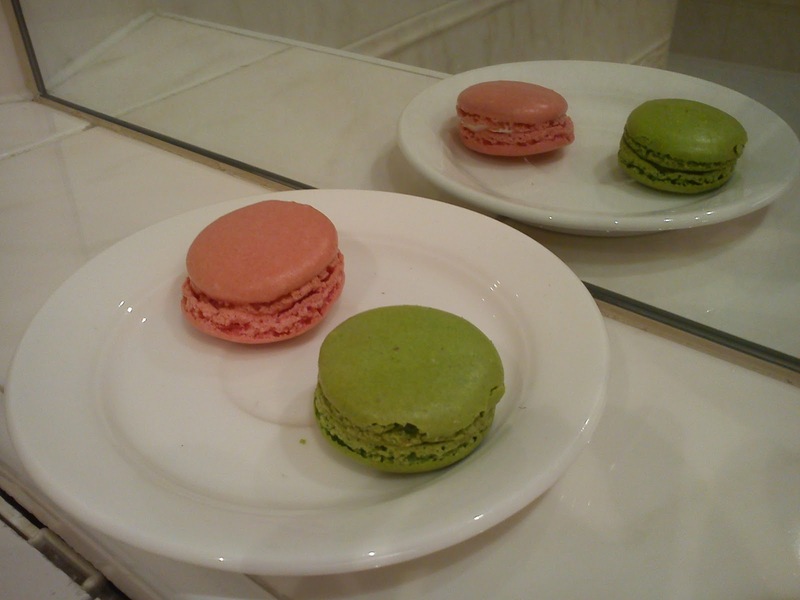 As a "starter" I selected two mini macaroons, one with rose and one with green apple. The macaroon with apple reminded my about washing my hair as a child in green apple hair shampoo ! Do you recall the flavour of this green apple shampoo ? It was a very domintating flavour. However, the apple macaroon was tasting quiet good. The "real" cake was a raspberry top and bottom meringue with rose cream filling and fresh raspberries. This was perfect cake for both the eye and the mouth :-)) A wonderful combination of raspberries and bursting flower sensation from the cream filling. Uuuuhhhmmmm !! Last week I participated in a conference in Holland. 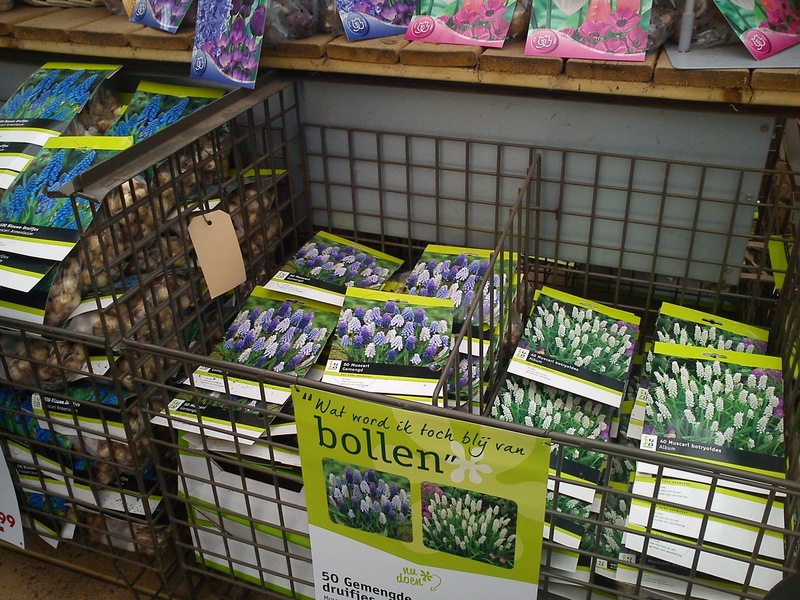 And what kind of souvenirs could you bring home from Holland ? Cheese ? Yes, this is an options, but my refrigerator is already full of cheese from this cheese basket. Tulip bulbs is definitely another option as a souvenir ! 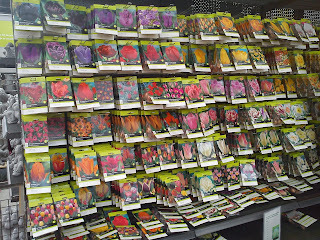 So my colleague and I decided to find a place, where we could buy different tulip bulbs, as we both are having gardens. One of the conference participants offered to drive us to a garden center, when she heard about our shopping plans. 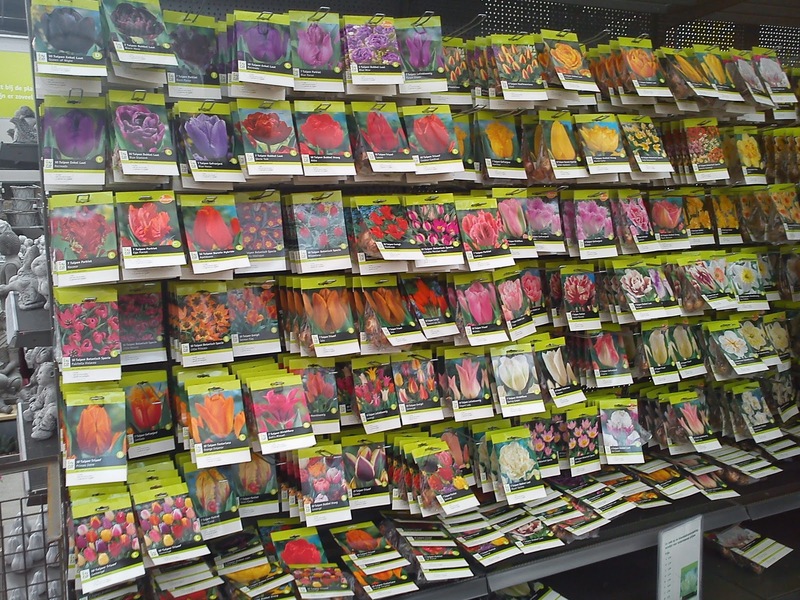 I will using these bulbs to fill up my garden lawn with another 200 crocus, which is a supplement to the 300 crocus bulbs already laying in my lawn. 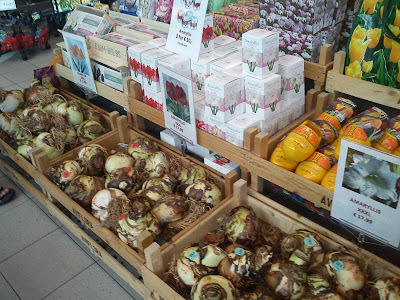 The different types of Narcissus I will use to expand my Easter bed in my garden. 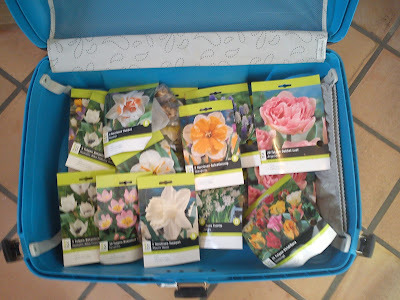 And all the different tulips I will use as replacement for the tulips, which did not blum this spring time. I am not a big cream puff fan﻿, but sometimes the cream puffs in the Frelsens Chokolade just looks to interesting to pass by without stepping inside to buy some. And as I eat my way through the cream puffs I most times gets disappointed as the taste is either too sweet or too bitter for me. I really dislike dark chocolate due to the bitterness in this type of chocolate, so a normal cream puff with dark chocolate is not my favourite, so therefore I wanted to try cream puff with a milk chocolate coating. And this was neither a favourite of mine, as the sweetness in the milk chocolate and the sweetness in the plain cream puff filling was just TOO SWEET for me, and I normally has a "sweet tooth" as we say here in Denmark. The dark chocolate cream puff with a liquorice filling was more interesting. It was still not perfect in my opinion, as I want liquorice food to actually taste of liquorice. And here in the cream puff filling needs more liquorice taste, if it wants to please my taste buds. I found the summer cream puff to be the best cream puff of these three cream puffs. The cream puff filling had a good taste balance between sweetness and freshness, so the raspberry filling was tasting of real raspberries. And the combination with white chocolate did not turn to sweet due to the freshness of the cream puff filling. But the summer cream puff did not managed to turn me without a cream puff fan yet. 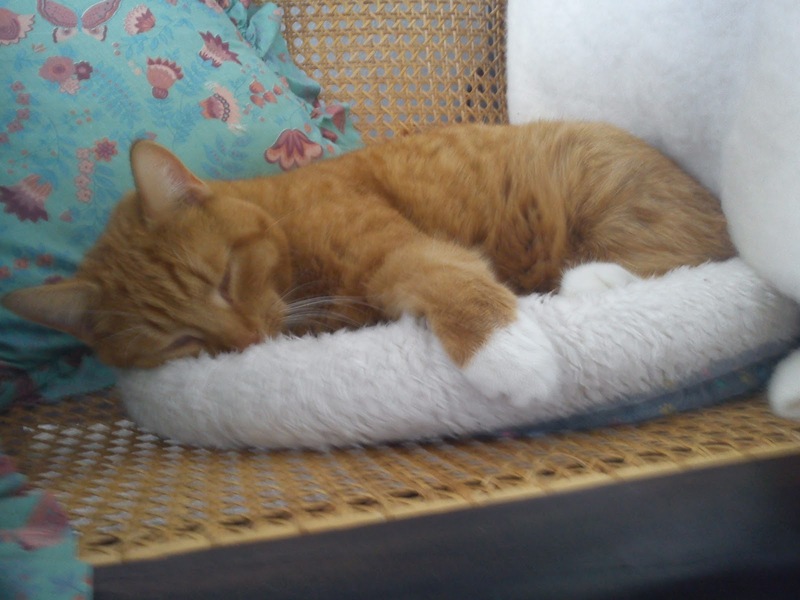 Hannibal taking a nap after a good night and day spend outside in the good weather. Perhaps he is dreaming about some freshly hunted "mouse sushi" found in the forest or in the green field. Another miles stone for my blog in form of 10.000 page views. Today (26 September 2011) my blog has been having 10.000 page views, since the very first post 13 November 2010, so within a time frame of almost 10 months. 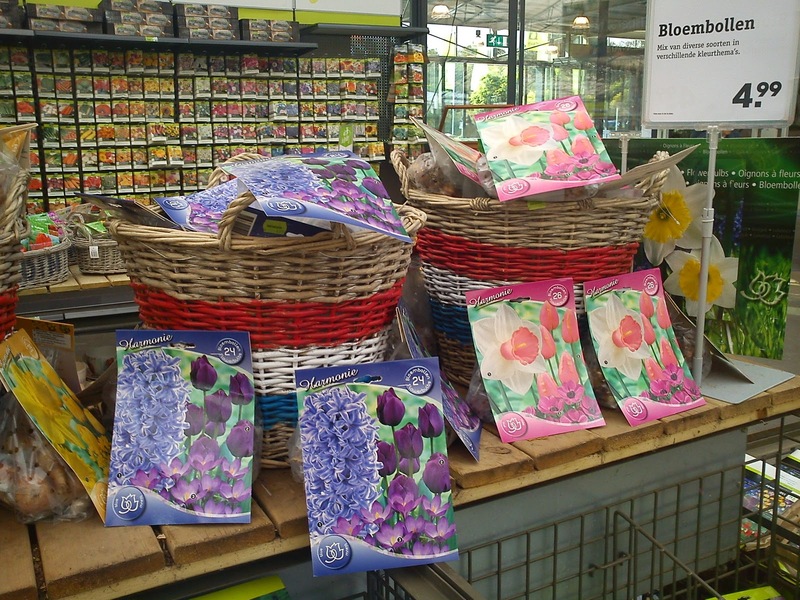 Also this month of September is also going to be the most "busy" month so fare having the highest amount of visitors in-side my kitchen and kitchen garden. So thank you very much for your many visits to my blog, where you take the time to read about all the various activities on-going both in-side my kitchen and out-side in my kitchen garden as well as what Hannibal the Cat is up to from time to time. Also a big thank you for your participation in some of the on-going voting about, what kind of cake or muffins I should have been baking for some picnic rowing tours. My fellow rowers are really looking forward to eat and enjoy the outcome of your cake elections. Since my last update on various mile stones I have been adding a recipe overview in order to make it more easy for both you as well as myself to locate recipes of interest for you. 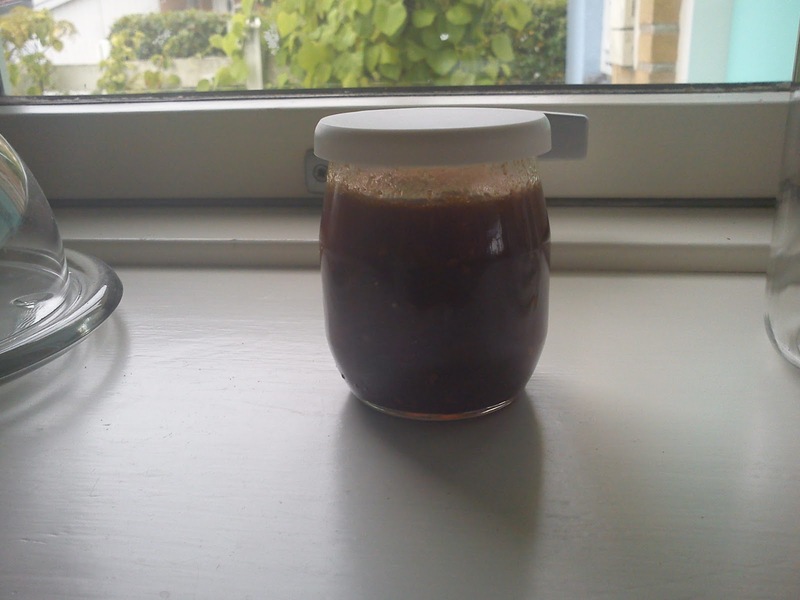 Recently I have started to share my evaluatíon of some ready-to-eat or ready-to-use products. You should read the posts, as my personal subjective evaluation, which I would like to share with you. 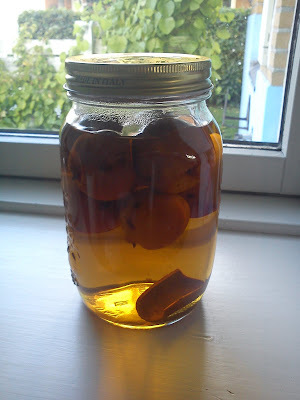 ﻿It is a very interesting process to see the colour difference taking place in the different fruit alcohols, which I have been creating this Summer/Autumn. This time, I would like to show you the colour difference in crab apple aquavit, which now is 1 week into this process. This time the cinnamon stick is not so un-folded as it was in the apple aquavit, the crab apples also remains located in the bottom of the glass. However, the crab apples just the small apples have turned transparent. The colour has turned from clear colour into the colour of older white wine. 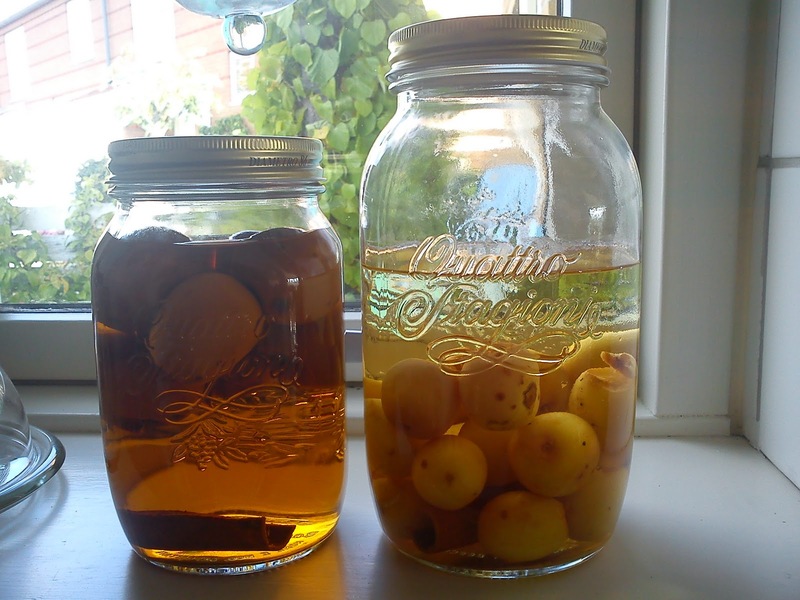 Below you can see the difference in colours between the two different types of aquavit. It is the apple aquavit to the left side, while you have the crab apple aquavit to the right side. As mentioned previously I really looking forward to taste the difference between these two aquavits, so I am in the planning process of getting hold of some friends for such an occasion in November. Cup cake, cup cake and yet some more cup cakes !!!! 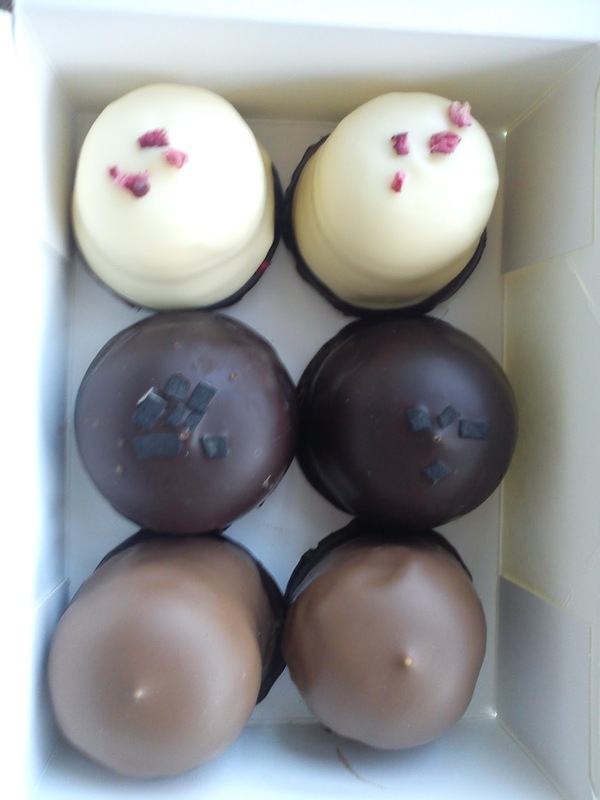 Even in Vejle the trend of cup cakes has arrived at the bakers as well as in super markets bakery department.﻿ So I bravely enough decided to try some of these cup cakes sold by Kvickly. 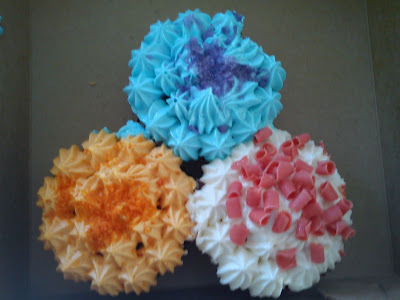 The blue topping is a blueberry cup cake, the orange topping is a carrot cup cake and the white topping with the red spots is a raspberry cup cake. My overall impression is, that these cup cakes are too industrialised in taste and texture. They taste OK, but they are not fantastic in any way at all. I really like risotto :-) If risotto is on the menu card, when I am out eating, I will 8 out of 10 times choose the risotto dish. I also like to make risotto at home. 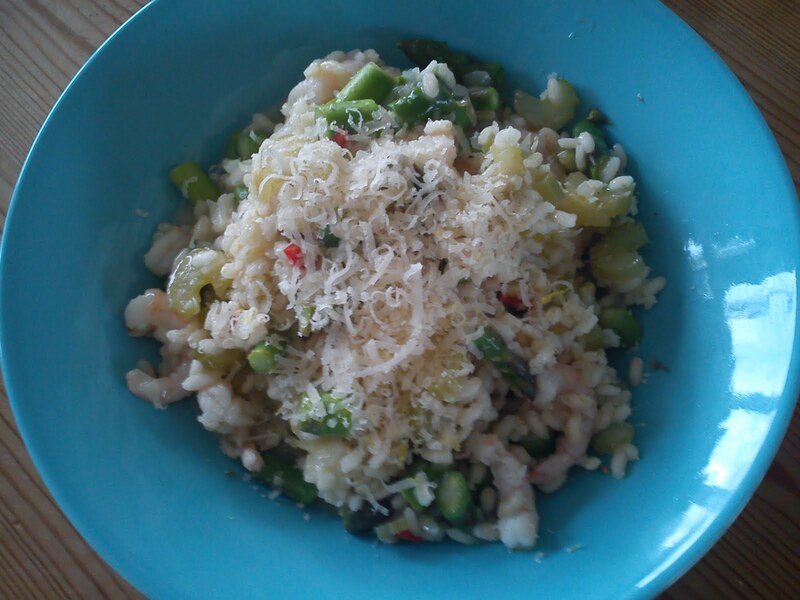 It is not a difficult dish to make, however, I still have room for improvement on my home-made risotto. My risottos are not as creamy as the risottos, which I eat outside my little kitchen. Perhaps the restaurants are using more cream, than I am doing ? Heat the oil in a cooking pan. Add the minced onion, garlic and celery. Fry for 2-3 minutes. Add the rice and fry them for 1 minute. Pour the white wine to rice. Let the rice absorb the wine. Afterwards slowly add the vegetable broth in smaller portions. Let the rice absorb the liquid before adding more. This cooking approx takes 15-20 minutes. Together with last portion of vegetable broth add the asparagus. After the last water is absorbed add the lemon zest, lemon juice, chili and scrimps. Serves together with grated Parmesan. ﻿I believe you know the traditional starter in form of mozzarella, tomatoes, basil leafs, oil and balsamico ? 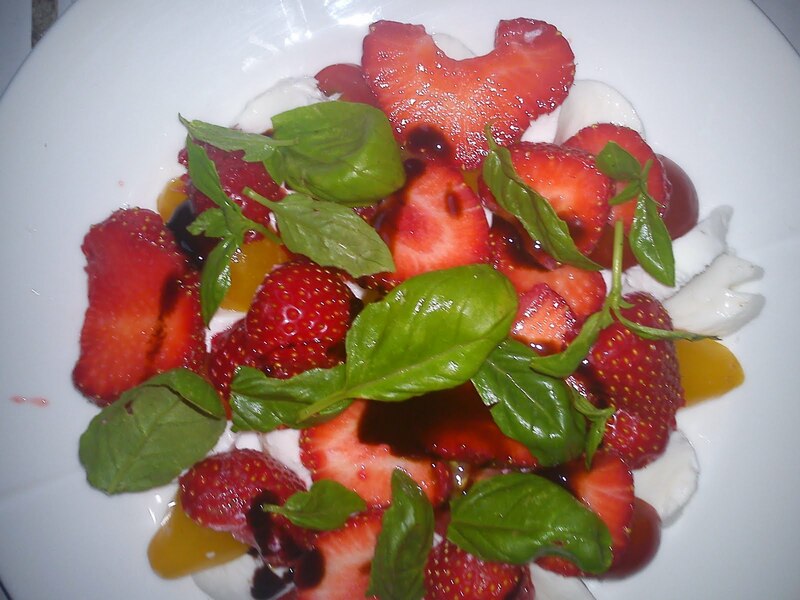 I have tried to make a little twist to this starter by adding some slice of strawberries as well. I used a ratio of ½ tomato slices and ½ strawberry slices, which I found to become too sweet. So next time I think I will use a ratio of 2 part of tomato slices to 1 part of strawberry slices. Getting to an end of the plum season I decided to use the last plums from a picking session in some friends garden making two version of plum compote. I have found this recipe on plum-tomato compote in a newspaper: http://smagokologi.dk/Opskrift_Blommer.asp, which is based on recipe by Kille Enna´s cooking book called SMAG (TASTE). 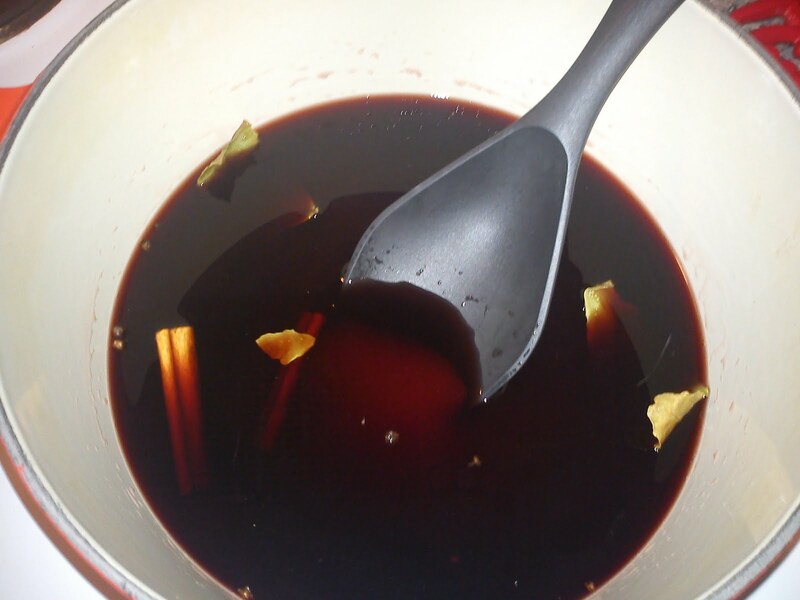 Looking at the ingredients in the recipe, I found it so interesting, that I wanted to test this recipe. 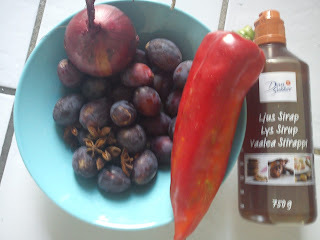 The smell, while the compote was cooking in my kitchen, was just wonderful, fantastic, lovely :-)) The smell was so much better compared this plum compote. 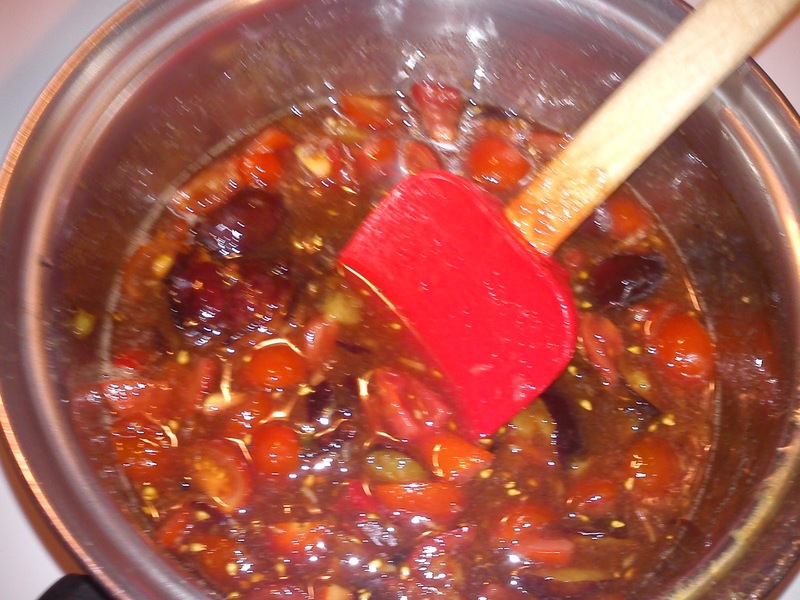 Served this plum compote together with cheese or cold meat. 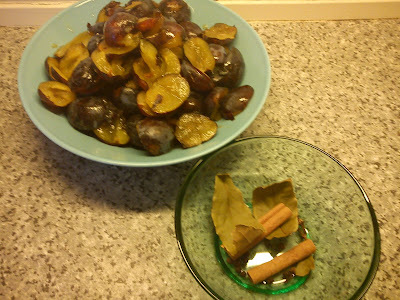 Remove the stone of the plum, and cut them into smaller pieces. Add all the ingredients into a cooking pot. Heat it up and let it cook for 15-20 minutes. 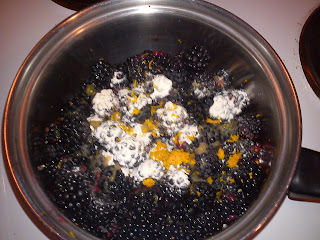 Add the pectin gelling powder and let it cook for 2 minutes. Prepare the storage glasses by filling them with boiling water. 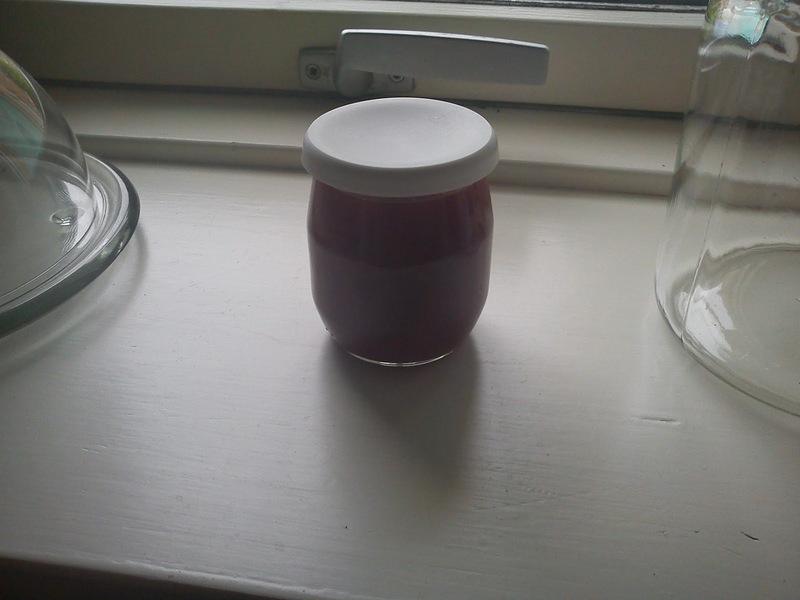 I do not use any preservatives in my home-made compote, so this is important to increase shelf-life of your compote. Another thing you can do is to store the jam cold afterwards. There is not enough sugar in this compote to preserve it. This is the first version of plum compote, I have been making, using inspiration from Dansuker on plum compote http://www.dansukker.dk/dk/Tema/ÅRET_RUNDT/Sommer/Pluk_blommer.aspx. I am "in love" with the flavour of star anise, it reminds me about Pernod and Christmas. So if you see me sniffing like a cat in the kitchen, it is because I smelling to the wonderful flavour of spices and herbs with a fantastic smell. Served the plum compote together with cheese or cold meat. Remove the stone of the plum, and cut them into smaller pieces using a mini chopper. 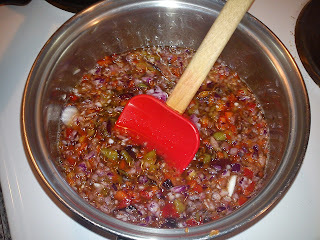 Cut the red pepper fruit and the red onion into small pieces using a mini chopper. Heat it up and let it cook for 5 minutes. A big thank you to all of you, who participated in my third cake election vote. It was you, who actual decided, which type of cake I should prepare for a picnic row yesterday :-) I really appreciate, that you took the time to and helped me with this important decision. So this time it was easy to transform your decision in a cake compared to last time, where is was a dead end on the votes and I had to take the decision making squash muffin. The most tricky part about this cake is the baking part, getting the right texture. First I baked the cake for 25 minutes as stated in the cooking book. However, the cake was too soft - un-baked - below the baked surface. So I decided to bake it for another 10-15 minutes at 200'C after it had be resting in the kitchen for 45 minutes. Melt the chocolate in microwave oven. Stir oil and brown sugar into the melted chocolate. It is very liquid. Whip the eggs, one by one, into this mix using a electric whipper. Stir flour and baking powder into the cake mix. 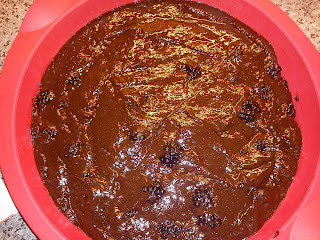 Gentle stir the blackberries into the cake dough. Add the cake dough into a round form of 27 cm. 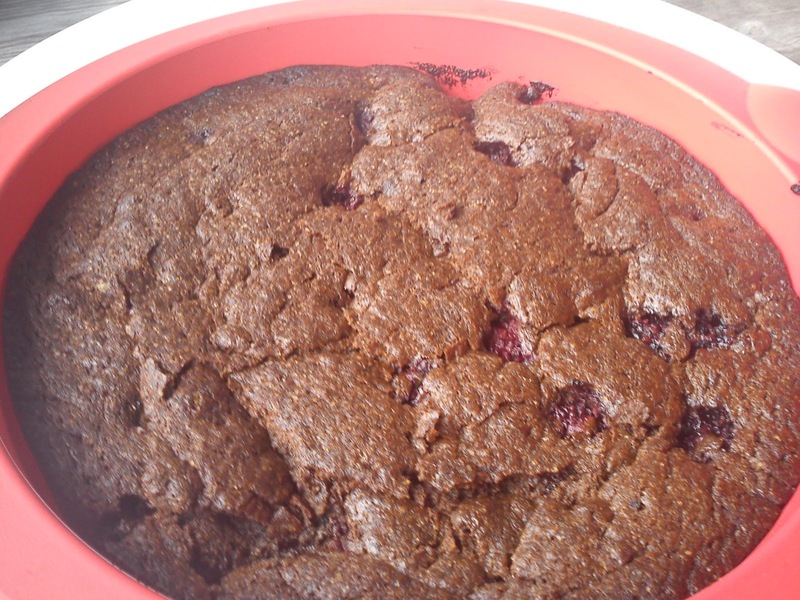 Bake the cake at 200'C for 35-45 minutes, until you have the desired texture. The cake should be baked, but stilling having softness. 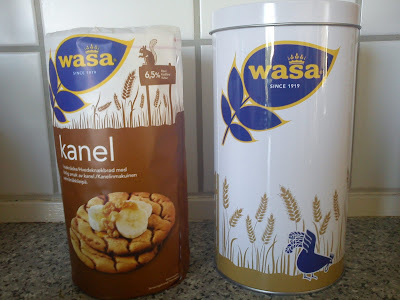 This only reason why I decided to buy this Wasa crispbread was because, the crispbread was sold including a metallic tin. 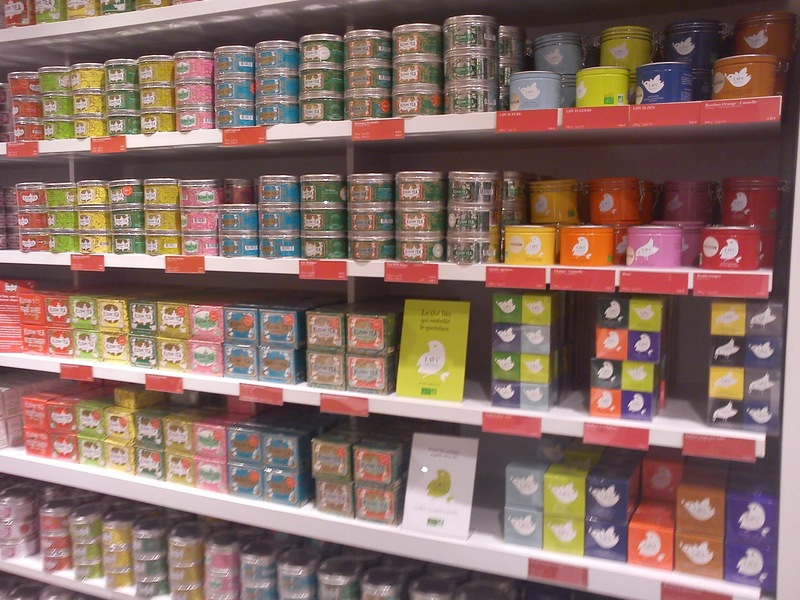 Place a metallic tin as a part of food pack, and YES I will place it in the shopping basket !!! Luckily enough for me, this round shaped crispbread having the flavour of cinnamon is actual tasting very good. So it has been good bargain for me: good taste AND the metallic tin. As I have mentioned previously I have found a small recipe collection in a local supermarket with various suggestion for home-made flavoured aquavit, where I last week made Apple Aquavit using small apples from sourced from the garden of friend in a neighbour city. However, the recipe actual "requires" the use of crab apples !!! So after another round of "sourcing" at work I located a colleague, which is having crab apples in his garden. 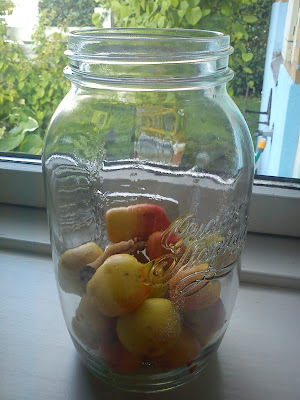 So yesterday morning, when I arrived at my desk at work, a bag of crab apples was waiting for me :-) Actual I still have some crab apples let in my kitchen, so if you have idea about how to use these apples, please feel free to drop me a comment. It is amazing to see, how the cinnamon stick unfolds within the first two days. 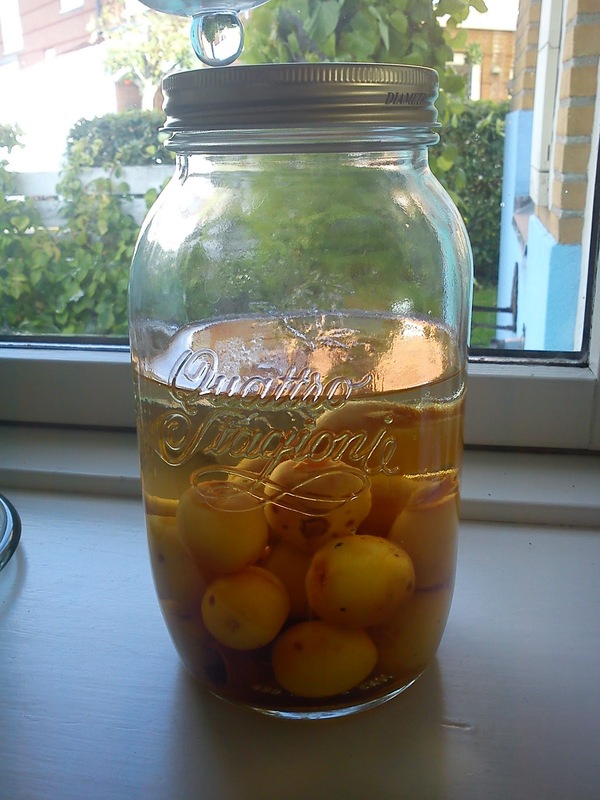 And I really look forward to smell and taste the differendes between these two types of apple aquavit, one based on small apples and the other one on crab apples. Empty the glass for boiling water. Fill half of the glass with crab apples. Let the Apple Aquavit stand for 2-3 months. Remove the apples and cinnamon. Let the aquavit pass through a coffee filter. Enjoy the Apple Aquavit together with dessert. 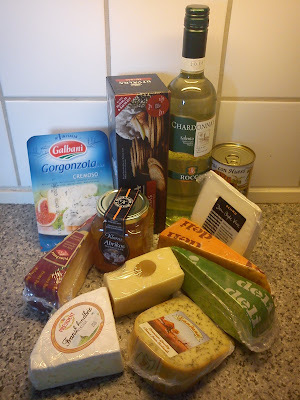 This afternoon I picked up a cheese basket, perhaps I should rather write cheese bag from THE best cheese shop in Vejle called "Osteriet". 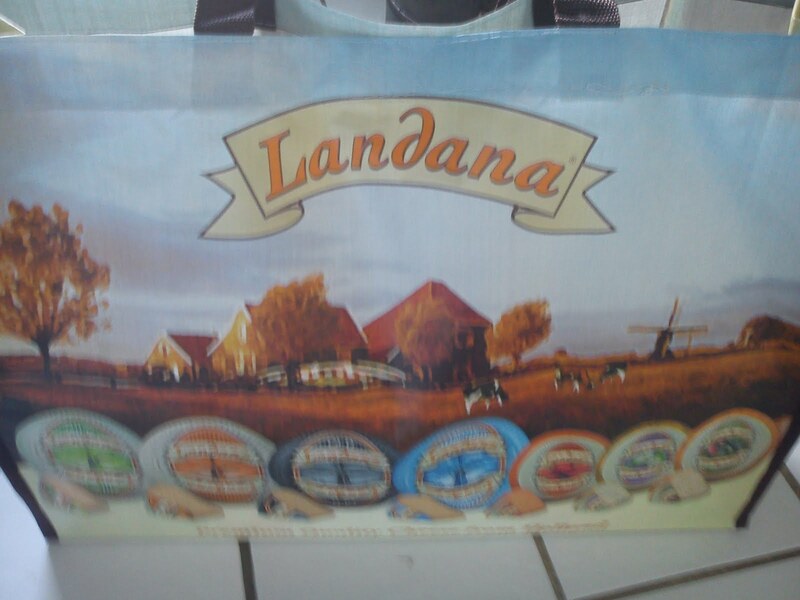 I had brought this cheese basket with 50% discount using an internet offer. I am going to enjoy to taste all these types of cheese. Perhaps I will find a new cheese favourite ? After the summer period, where I have not been baking any buns at all, I have started again to bake my way through the bread book "Hjemmebagt". 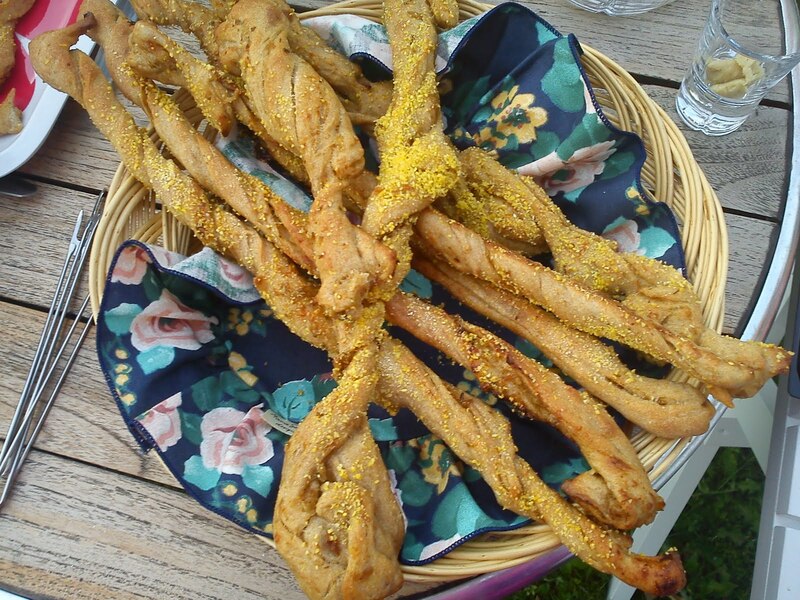 I decided to make an easy start making bread sticks for the annual barbecue garden event. At least I thought, it was an easy task !!!! It was easy enough to make the actual dough, but afterwards the rest of dough forming process was one big STICKY MESS !!!!! 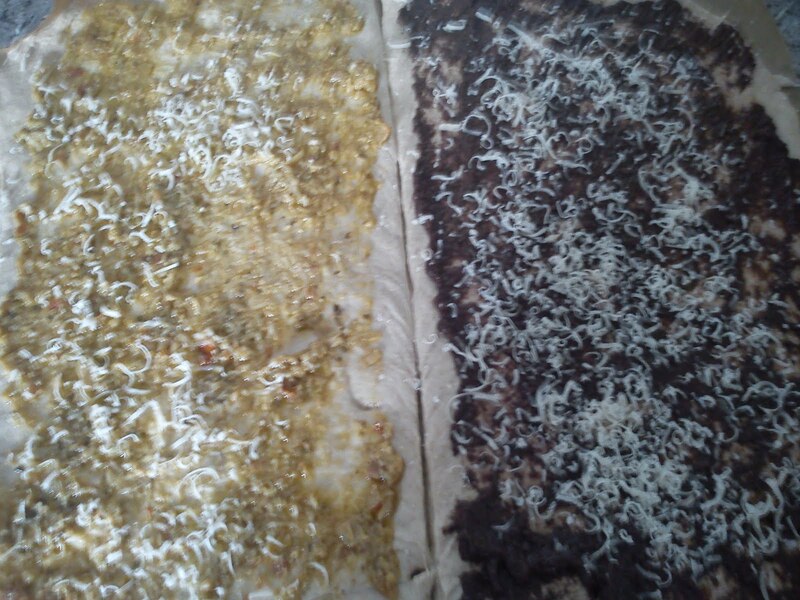 I was rolling the dough on baking paper followed by the spreading pesto on top of the dough. 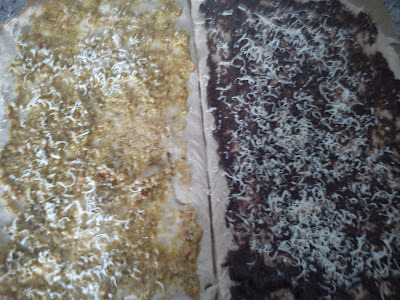 Afterwards you should fold the dough in over the pesto, and here the dough was sticking like glue to the baking paper. The next step was to cut the dough into thin sticks, which when should be twisted. And here the stickiness was continuing !!!! "The trick is FLOUR - plenty of flour. The flour should be on the kitchen table, NOT in the dough. In UK the bakers are referring to make a bed of flour, which the dough is resting, while you are working with it. With such a bed of flour, the dough should not stick to the kitchen table. I hope this trick will work for you as well". I hope this trick will work for me, so I will be testing this recipe again and let you the outcome of this trick. However, these bread stick taste wonderful. But you should really eat these bread stick the same day. 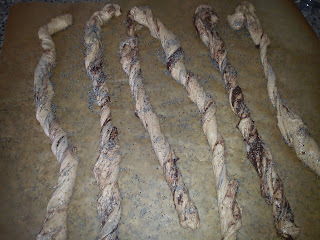 We could not eat all these bread sticks, so I save the left-overs for next day, in a closed container. And the day after the bread stick was quiet tough to chew. 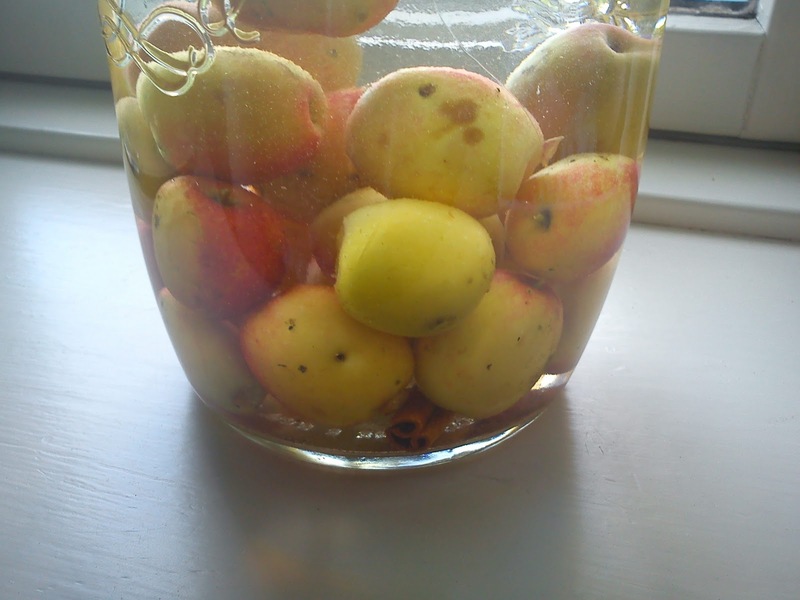 It is amazing to see the colour difference taking place in the Apple Aquavit, which I started last week, so within a time frame of 1 week. 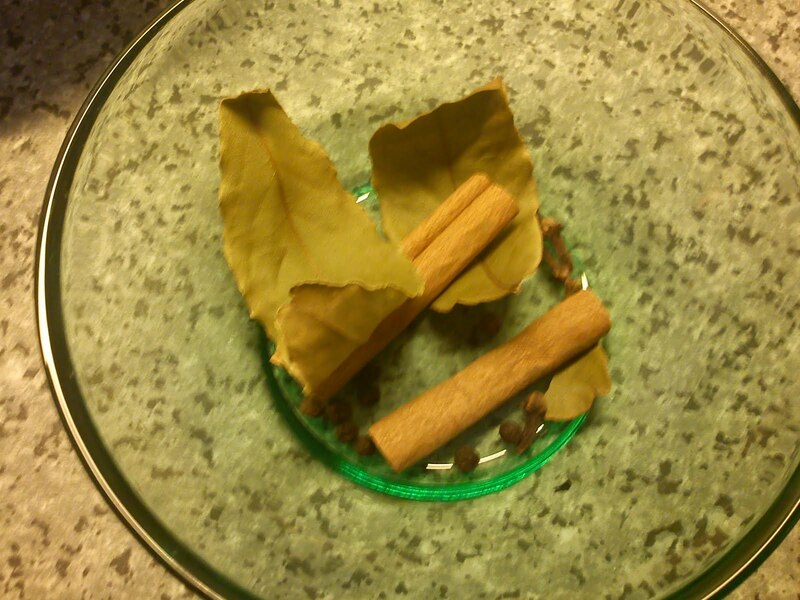 At the very beginning the cinnamon stick was looking normal, however one day into the process, the cinnamon stick was completely un-folded like a piece of paper. Also the apples have turned transparant. And the actual colour is looking like caramel. I assume this colour is coming from cinnamon stick, without being 100% sure about this. A work colleague of mine is having some crab apples on his farmstead, which I have been promished to receive some apples of. 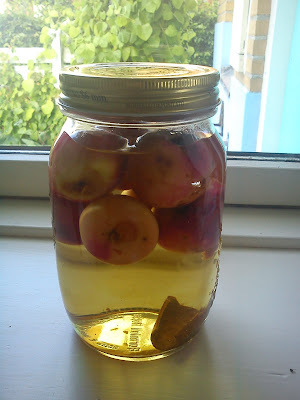 And I am planning to make a version using crab apples as well, so I can taste the difference between these two types of apple aquavit. 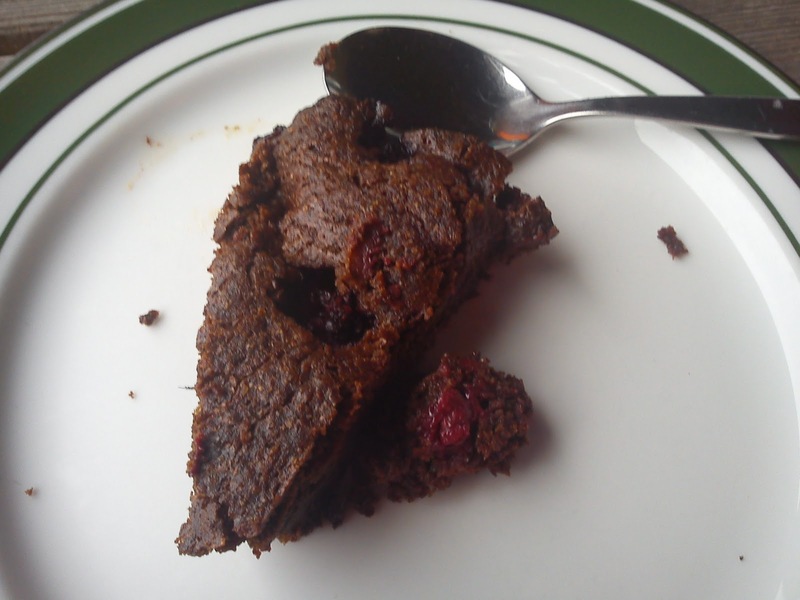 Looking at the on-going cake election, it seams like the brownie is going to be the winner. If you find, that either the carrot muffin or the chocolate muffin should be winner instead of, please take the opportunity to vote on one of these muffins. And if you believe the brownie should be the winner, keep voting on the muffin. The cake election is closing Thursday 15 September, the same day as the election to the Danish parliment will taking place. So two very interesting votes !!! As the plum is getting to an end, the blackberry season is taking over here in Denmark. 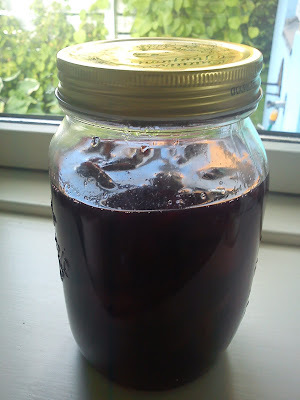 I do not have any blackberries in my little "park", but a good working colleague is having plenty of blackberries, which he very kindly enough shares with me :-) A small thank you gift, I afterwards share a glass of the jam with him. This is my second portion of blackberry received her in 2011. The first portion I enjoyed on my breakfast cereals. 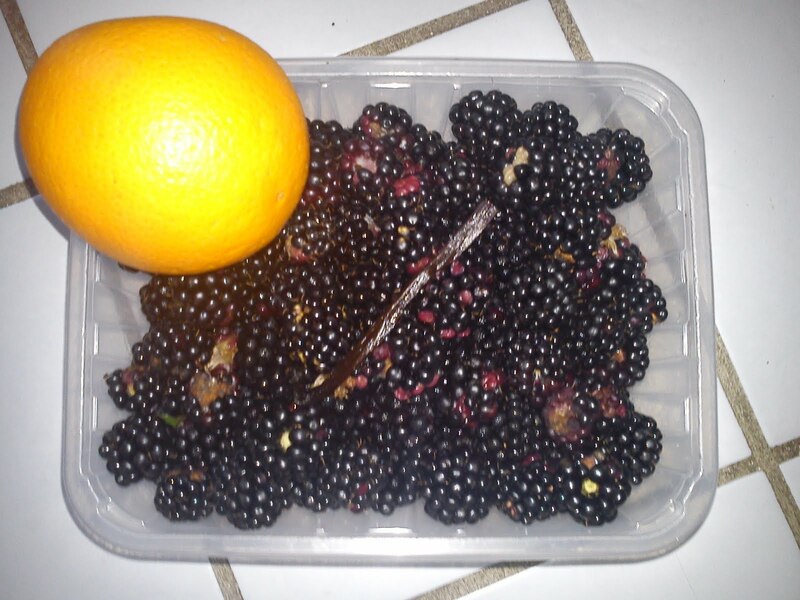 As the second portion was bigger I decided to make jam: blackberry jam with addition of orange peel, orange juice and vanilla. Peel the orange and squeeze the orange for juice. Remove the vanilla corn from the vanilla pod. 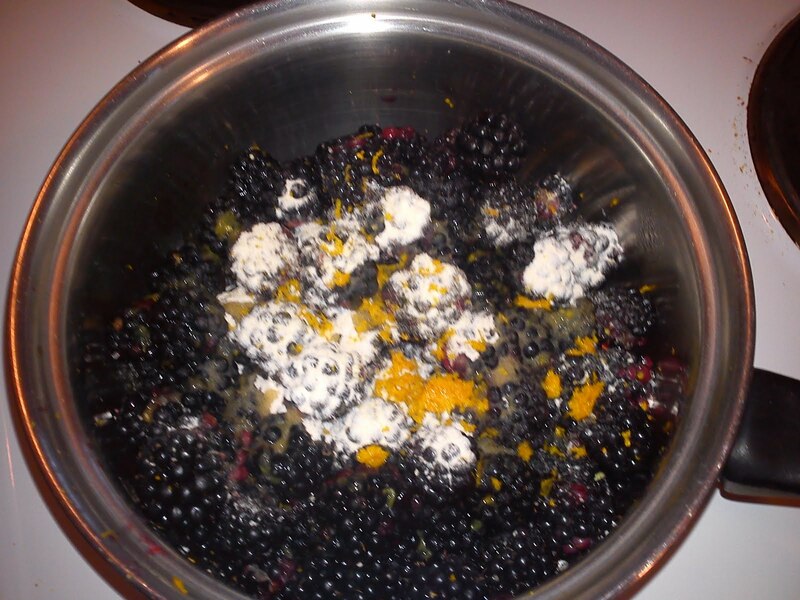 Heat up the blackberries in a cooking pot together orange peel, orange juice, vanilla corn and the vanilla pod. 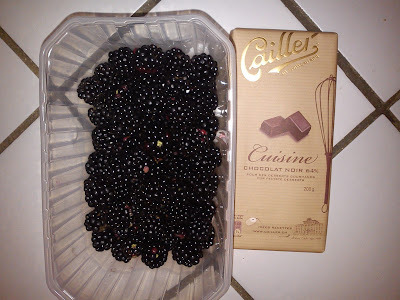 When the blackberries boiling, add the gelling powder and agitate.It is important NOT to add the sugar at this stage, as the gelling powder need the water from the fruit to hydrate sufficiently. During one of my business to Paris I as usual did some food shopping and finally one of these teas has made it all the way from the tea tin to the tea pot into the tea cup !!!! 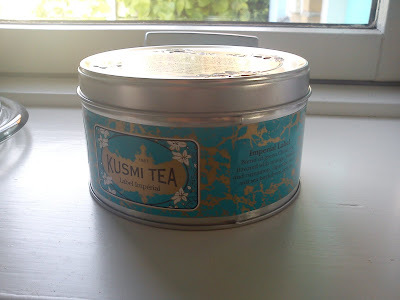 Label Impérial (Imperial Label) was launched by Kusmi in the beginning of 2011. This tea is a blend of green China tea flavoured with orange, vanilla and cinnamon, liquorice roots and sea buckthorn berries. I really like the taste of this tea, it has a sweetness of it's own, so I do not need to add sugar to the tea, which I normally do. So perhaps I should consider this tea as a diet tea ? A small reminder to you. I really appreciate it, if you spend some of your time and participate in the "cake election" about, which cake I should bake for the picnic row i the coming wee-end. My fellow rowers find it quiet amusing, that you as reader of this blog has an opinion about, what cake we should eat without actual participating in the row. 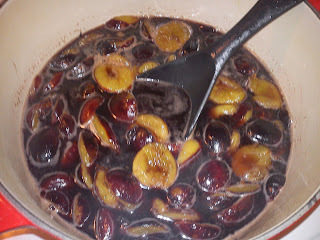 Yes, I am continuing with some more plum recipes from my kitchen, so we all can do our best to use this wonderful fruit. This time it is a dessert recipe, which you can store for later use﻿ in Autumn or Winter. And I am using smaller plums with a more firm texture. Your help is needed again !